Though unique in its establishment as a free colony in Australia, South Australia is not without its colourful criminal past. The sites included in this tour represent the establishment of the state’s law and order, some dating back to the early days of the colony itself. 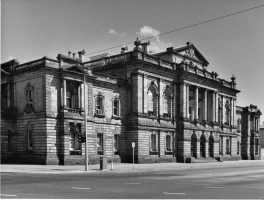 Highlights include the Magistrates Court, built in 1847-1850 and noted for its own rather controversial start, and the Supreme Court, one of the most impressive buildings in Victoria Square built from Tea Tree Gully sandstone. Most of these building are closed for public viewing, but visitors can enter the Adelaide Gaol, erected in 1840-1841 just shortly after the establishment of the colony. The Adelaide Gaol now houses a museum presenting the history of the site and visitors take in self-guided, guided and even ghost tours at the precinct. Contact the Adelaide Gaol for opening hours and tour times. For a printable version, view on Google Maps.